Assistant Teacher: Katie Moray received a Bachelor of Arts in psychology and healthcare studies from the university of Richmond. She loves to travel and watch movies! 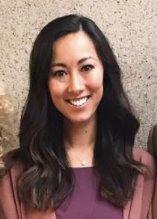 Assistant Teacher: Katherine Sumantri was born and raised in Singapore. She recently graduated from Gonzaga University in Spokane, WA with a Bachelor of Special Education. She loves sunsets and short walks to the fridge! Occupational Therapist: Katie Hanauer is starting her 9th year at Gillen Brewer. She earned her Bachelor of Arts in Art History (yes, really!) at Union College and attained a Master's Degree in Occupational Therapy at Boston University. Katie worked at sensory gyms in Connecticut, D.C., and New York prior to starting at GBS. She is an avid reader, terrible fantasy football player, and loves to travel. Speech and Language Pathologist: Liz is thrilled to be apart of the GBS community! She earned a B.S. in Communication Sciences and Special Education from Penn State University and graduated from Hunter College with a M.S. in Speech Language Pathology. She is so excited to be working as the Speech and Language Therapist for the Coconut Trees! Psychologist:​ Ben Klein came to Gillen Brewer in September 2010. Before coming to Gillen Brewer, Ben worked in the Department of Child and Adolescent Psychiatry at King's County Hospital. His extensive work experience with children includes both time spent as a teacher and a psychologist in a variety of school and hospital settings including the Child Development Center at the Jewish Board of Family and Children's Services and the Robert Louis Stevenson School. Ben received his Bachelor of Science in Human Development from Cornell University and both a Masters and a Doctorate in Clinical Psychology from Long Island University - Brooklyn Campus. Dr. Klein is a certified trainer in Nonviolent Crisis Intervention.